Crosshall Marine is a friendly family run business, which has been established for more than 30 years. We pride ourselves in offering our customers the best service possible in well kept grounds in a tranquil tucked away setting, and friendly atmosphere. 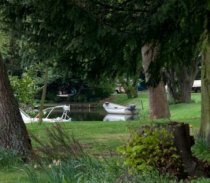 The marina is set in a picturesque four acre site adjacent to St. Neots Golf Course on the River Great Ouse approximately half a mile downstream from St.Neots town centre, a thriving historic market town. 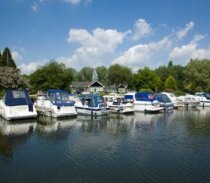 We have more than 100 pontoon moorings along 1500ft of river frontage, serviced by water and electricity. The marina’s workshop offers the full range services with on-site lifting machinery and slipway and an on-site chandlery and provides Calor Gas & diesel. We have modern toilets and showers. An Elsan disposal point and refuse area is also provided. There is an active boat club operated by berth holders. Membership is available on request. Click on the following link for more information: WHBC or call into the marina office. We operate a thriving brokerage sales department, with used boats for sale and advice on insurance and finance. Berths can be paid for in advance at our discounted annual rates or quarterly or monthly by direct bank payments. We also take bookings for seasonal berths, hardstand and overnight moorings. We offer dinghy and canopy storage.